National Prescription Drug Take Back Day is a nationwide effort that takes action against opioid abuse. Spearheaded by the Drug Enforcement Agency (DEA), with cooperation and support from other federal and state organizations, this day provides an opportunity for us to safely dispose of unused or expired medication, and thereby preventing their misuse or sharing. S.A.F.E. Project urges you to participate in this event and take action committed to stopping opioid misuse that can lead to addiction and more overdose deaths in this nationwide epidemic. With locations nationwide, participating in Take Back Day is convenient, effective and an absolutely critical step in the fight against opioid misuse and addiction. Opioid addiction is more than a public health crisis, it’s a national emergency. 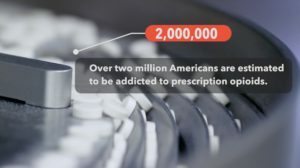 In 2015, nearly 6.4 million Americans misused opioids simply by reaching into unlocked medicine cabinets, or by receiving handouts from friends and family. Self-medicating and sharing prescription medicines is more dangerous than you might think. Opioids are addictive. And addiction is a disease. Learn the facts that can save your life!